If you’re an avid cook, and want your kids to love cooking as well, it’s best to introduce them to the joyful aspects of baking and cooking early on so you can all have fun in the kitchen. But first,you have to make sure your kids are firmly “in-the-know” when it comes to important kitchen safety habits and rules. Placeplastic bags, matchsticks, knives and other potentially dangerous items out of the reach of children. Keepflammable materials like pot holders, towels, curtains, etc., well away from the electric or gas stove. Instruct your kids to keep a safe distance from the stove and to never climb on top of the refrigerator, dishwasher, washing machine, or dryer. Put locks on cabinets or drawers that keep hazardous materials. As head chef of the household, remember to always lead by example. Don’t just teach the following lessons once and forget them later, otherwise your children will model your behavior and do what they want in the kitchen. Demonstrate knife safety and how to safely walk with a knife when other people are present. Keep the knife in your dominant hand down straight by your side. 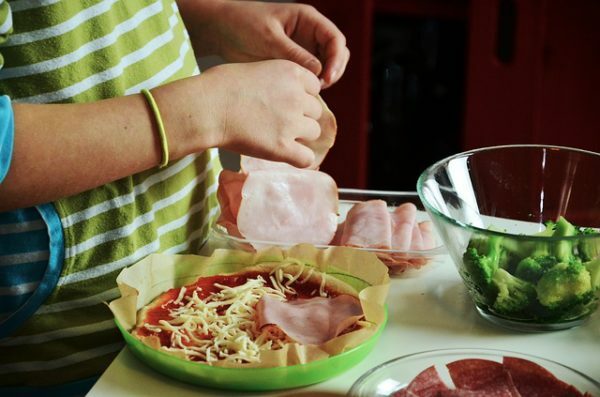 Before starting food prep, teach your kids to wash their hands and clean the food prep surfaces. Also, have them keep their hair tied back and to make sure their extra-long or loose sleeves are all rolled up so that they don’t dangle near the stove. Continually urge them to wash their hands between any tasks requiring a change of kitchen equipment or the type of food you’re preparing. Warn them to be extra careful when handling raw meat and raw eggs, as these are carriers for dangerous germs that can cause serious foodborne illnesses like salmonella. Teach your children to use wooden utensils when stirring hot contents. This way, if they leave the instrument in the pot for a while, it’s handle won’t become hot to the touch. Have your kids use a sturdy chair or stepladder that allows them to look down on the stovetop and have a full range of motion when stirring. Teach your kids to keep handles facing away from the edge of the stovetop. Have them handle potholders and towels carefully. Make sure they never use wet towels or potholders to handle baking dishes or hot pots - the moisture transfers the heat quickly, which can lead to a steam burn. In the event a fire in the kitchen arises, teach your older kids how to use a fire extinguisher, and what escape plan to follow should the fire continue. Conduct a fire safety drill so that your children will know what to do when an especially bad fire accident breaks out. The kitchen is the center of your home where so much family bonding takes place. By teaching your budding cooks the above safety tips, you’re able to make them fit and responsible enough to eventually join you in the highly enjoyable activities of cooking and baking.